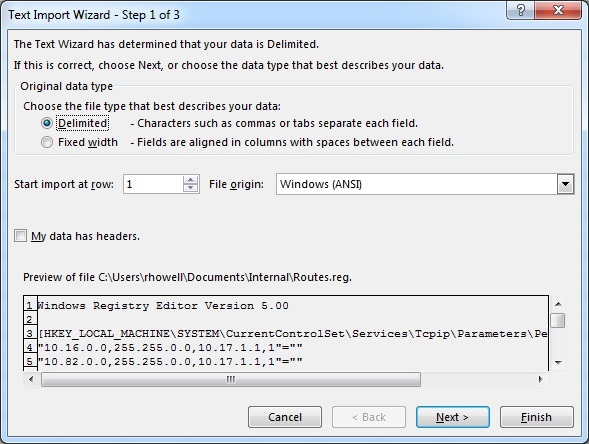 In previous versions of Windows if you wanted to import a large number of persistent routes you could import them directly into the registry. 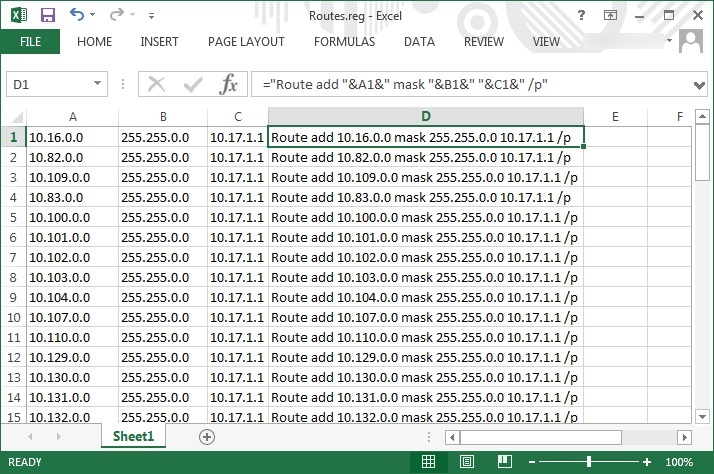 This no longer works on Windows 2012R2 so here’s a simple method using excel to create the ROUTE ADD commands. 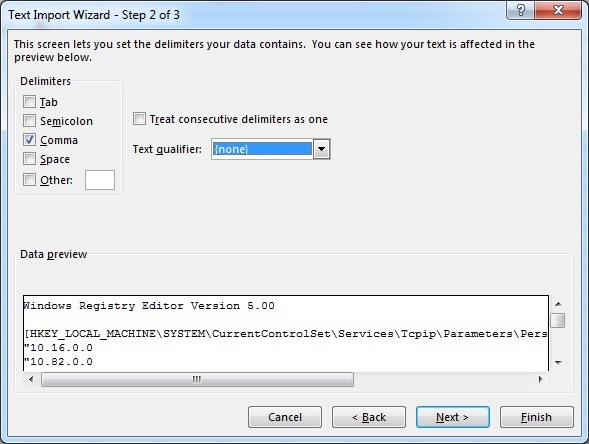 Right click on PersistentRoutes and Export to a .reg file. 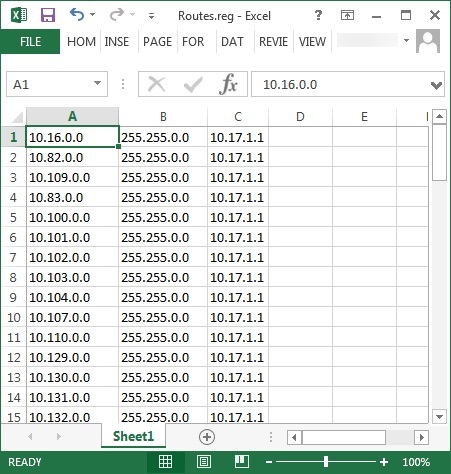 Copy the .reg file to your workstation that has Excel on it. Once completed you should have an Excel that looks something like this, don’t worry we’ll clean it up in the next step. 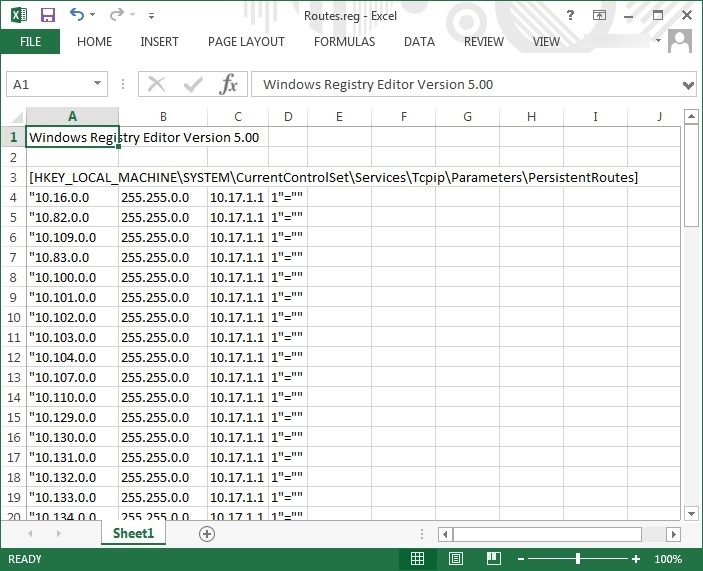 In Excel, delete the first three rows that contain the regedit header info. Also delete column D – the one that contains entries of 1″=””. Then select column A and hit CTRL+F to open the find and replace window. Click on the Replace tab and put a double quote in the “Find what:” box (leave the replace box empty) and click on Replace All – this removes all those double quotes from the column. 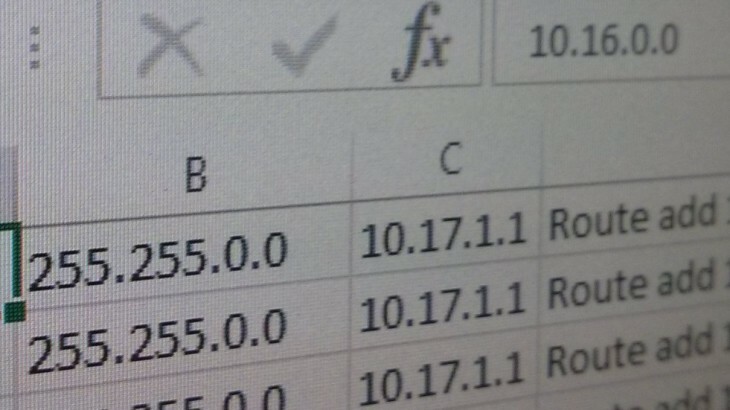 Create Command Batch file from Excel. So now to the clever bit copy the formula from below and paste it into Cell D1 (make sure you leave all the spaces in the formula). ="Route add "&A1&" mask "&B1&" "&C1&" /p"
You should see that the cell now magically contains the DOS command to add the required route. You can quickly add the formula to the cells below by clicking on the cell D1, then shift click on the last cell in column D that you want the formula to populate and then CTRL+D to “fill down”. 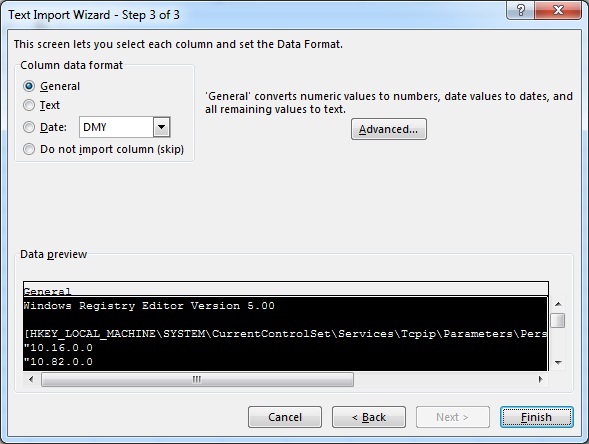 Finally, we’ll create a new worksheet for the commands; select column D and right-click/copy. Open a new worksheet by clicking on the + in the sheet tabs area. On the new sheet right-click on the first cell and choose Paste Values (if you do a regular paste you’ll get a lot of #ref! errors). 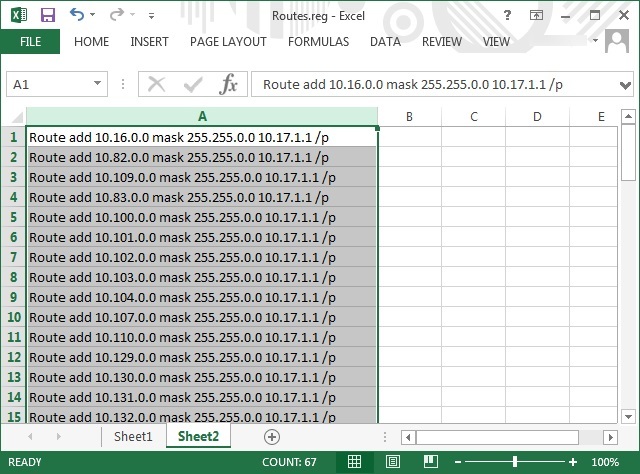 Save this worksheet as a text file and you now have all the commands you need to add the persistent routes on the destination server. If you are the cautious sort you can cut and paste the commands into an administrator command prompt on the destination server. 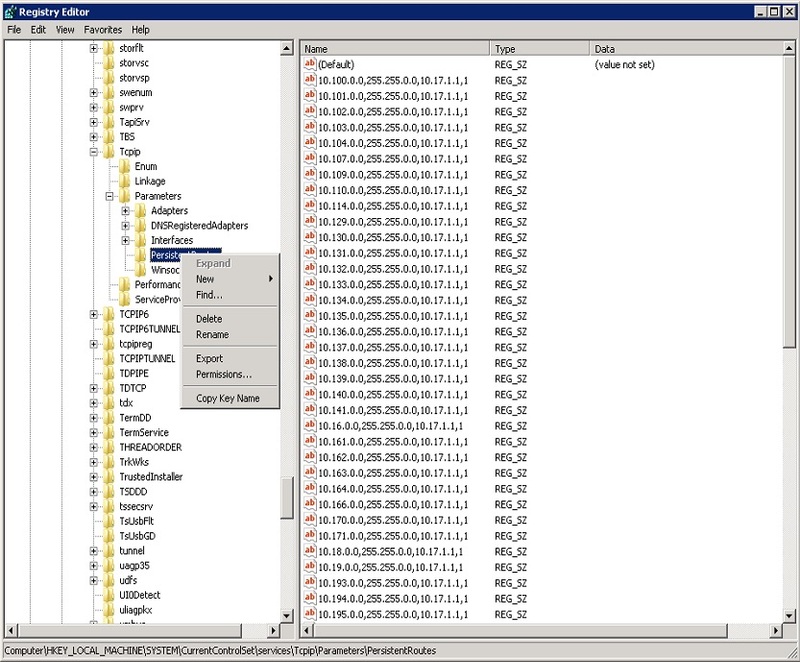 If you are confident you can rename the .txt file to a .bat, copy it to the destination server and run it (as admin) to add all the routes in one hit. Featured Posts, How to..., Windows 2012R2, Excel, Persistent Route. permalink.